There are generators that use natural gas to operate instead of gasoline. Some are portable but the vast majority are stationary. Most are standby units which come on automatically when an outage is detected. Many of these models are dual fuel propane and/or NG models depending on what your source of fuel is. To find the best natural gas generators for home use search online and at your local hardware store. Here are a few good choices. If you want generator that will come on automatically when the power goes out at home, check out more standby generators reviews here. 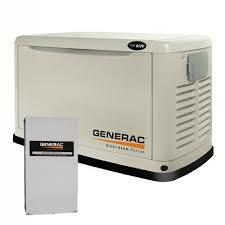 This Generac Core Power Series 5837 Natural Gas Propane Powered Standby Generator is a prepackaged system with several items including a 50 amp transfer switch and an 8 circuit load center with breakers. It has a main line circuit breaker. It is very quiet at 10 dba and runs quieter than competitive generators. This is a stationary generator that comes with a mounting pad rather than using a concrete base. It is protected from bad weather and comes with a battery charger. It has an air cooled OHV engine. It costs about $1,800 online and it received 4.5 stars from Amazon reviewers. This Briggs and Stratton 40326 Natural Gas/Liquid Propane Powered Home Standby Generator has an air cooled 803cc OHV engine and runs 1.42 gallons per hour on half load. It comes with a three year limited warranty and a battery charger. It has an hour meter to avoid overloading and a diagnostics alert system for any possible problems that may occur. It has a rust proof outdoor protection to avoid corrosion throughout the years. It comes with a transfer switch and has an automatic start. This standby can be placed within 20 inches from your home. It runs on 11,000 watts continuous and 12,000 watts surge. It is considered one of the best natural gas generators for home use. It can power up tools, machinery as well as lights and appliances in your home. It costs about $1,850 online. 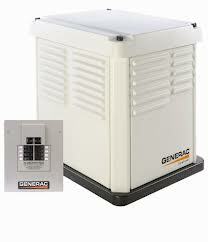 This Generac Guardian Series 6052 Standby Liquid Propane/Natural Gas Powered Generator comes with a transfer switch and earned 4 stars from Amazon reviewers. It costs about $3,400 online. It has a 200 amp service rated smart switch with a digital load management. It has user friendly digital controls and an engine display to determine when it needs maintenance. There is an external main circuit breaker and sturdy steel enclosure to help protect the life of the unit. It has a RhinoCoat finish for weather protection. It runs quietly on 14,000 watts surge. It will power up your home within seconds of a power outage without having to press a button or flip a switch. 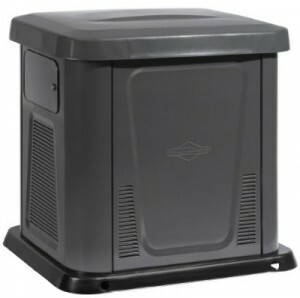 This Briggs and Stratton 40301 EmPower Natural Gas/Liquid Propane Powered Home Standby Generator runs on 7,000 watts surge. It comes with a four year warranty and a 504ccintake engine. It is carb compliant and is sold in all 50 states.It has a quiet operation and comes with an acoustic foam dampener. It is designed to save space with its contemporary design and with its steel enclosure it is protected from bad weather and extreme heat and cold. This item received 4 stars on Amazon and costs about $1,500 online. 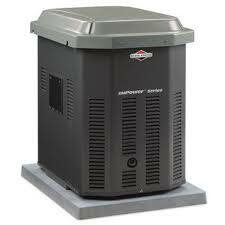 All of these are among the best natural gas generators for home use that you will find on the market. They have various features that makes them ideal to use when experiencing a power outage or to generator power for appliances or tools.